There is a growing number of books on the theology of T. F. Torrance, but if you were going to buy just one, you’d want to get Alister McGrath’s important work, Thomas F. Torrance: An Intellectual Biography (Edinburgh: T&T Clark, 1999). This volume has just been released in an attractive new paperback edition, and the good people at Allen & Unwin (via their marketing guru Drew) have been kind enough to send me a copy. McGrath’s work offers both an overview of Torrance’s life (supplemented with lots of nice photos) and an account of the development of his theology, with particular focus on Torrance’s relationship to Karl Barth. And while other studies of Torrance rely solely on published materials, McGrath also closely analyses Torrance’s unpublished lectures on dogmatics from the late 1930s. As McGrath shows, this unpublished material is especially valuable for grasping the early shape and development of Torrance’s thought. Further, this book is important not only for an understanding of Torrance, but also for an understanding of McGrath’s own recent work on the relationship between theology and science. 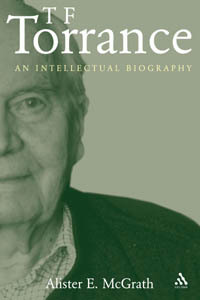 His three-volume Scientific Theology (also abridged as The Science of God) is indebted above all to Torrance – McGrath describes Torrance as his theological “role model,” and he dedicated the first volume of his Scientific Theology to Torrance.